Discussion in 'iMac' started by AppleFan360, Nov 20, 2014. I currently have a 2013 27" iMac with a Dell second display running the same resolution (2560 X 1440). If I get the 5K iMac, will the iMac "downrez" the 5K display to 2560 X 1440 for the second display or will I have a mismatch between the two displays? Your choice really... Both display are independent and can be set at different or similar resolution. Are you planning to Mirror or Extend Desktop? If you Mirror it will downscale the HiDPI resolution to fit on the second display's lower pixel density (the 5K should maintain full HiDPI resolution). If you Extend Desktop, it will create a resolution separate from that of the iMac's display and seamlessly switch windows between HiDPI mode and non-HiDPI mode depending on what display they're on. I use a 2560x1440 in extended. Below is a photo. It requires some finesse; you can be much closer to the riMac than the extra monitor, so I had to do some fiddling around. No point in having them at the same distance; either the 2560 would look pixellated, or you have wasted money on the riMac. And BTW, note how Aperture scales the photo automatically: that's "actual size" on both monitors, evidencing how the system can show photos at 1:1 but keep UI features at retina resolution. Thanks for the info. So in other words, if I extend the display, the 2650x1440 display will not look the same as the iMac display (image size wise)? Dang, I was hoping Apple would have done something about that. One of the reasons why I got the 2650x1440 second display was to exactly match my 2013 iMac display so everything would look the same (desktop, icons, windows, etc). Now I'm going to be right back in the same boat again after I get the 5K iMac. I just did a test with my rMBP. If I have the built screen in retina/HiDPI mode and the external display in normal mode, I can take a window from one screen to the other and its not 'shifting sizes'... I can even split the window and see the extra detail on the retina display. Caveat: I don't have aperture or other photo apps on my system, but I wouldn't think they'd behave differently. You could see if at an apple store they'd let you hook a non-retina imac to a retina imac via thunderbolt and test it out. Just as a followup to this thread in case anyone else was wondering. I finally did get my riMac and I'm using my Dell 2650x1440 display along side in extended mode. Apparently when you first turn on the riMac, it defaults to 2650x1440 which is referred to as "Retina Best" in the display settings. The Dell display is the same resolution so all text, windows, tool bar etc. are exactly the same size on both displays. Obviously the text and just about everything else on the retina display look better and more crisp. I'm very pleased about how this all worked out. 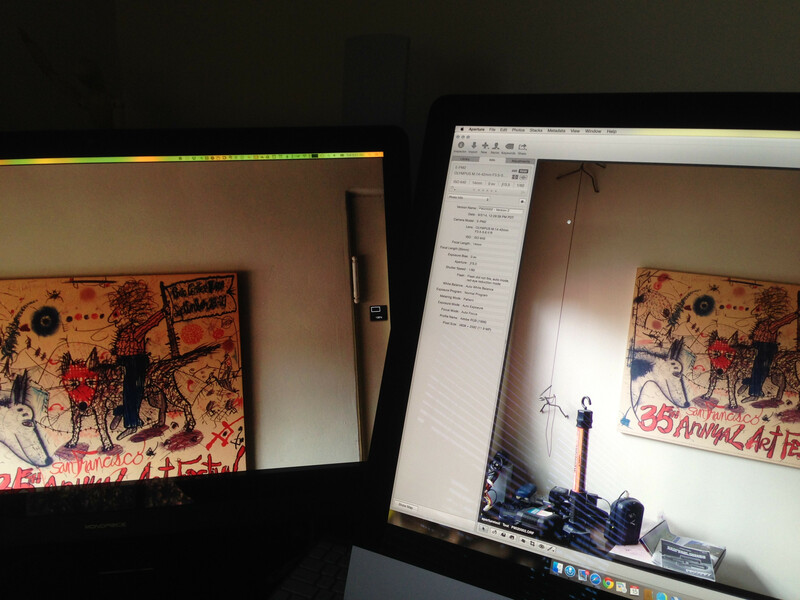 What's really interesting is having a regular 2650x1440 display sitting right next to the retina display. You can do a direct comparison between the two. The text is so much more jaged on the 2650x1440 display. With retina, it's like someone painted the text right on the screen. Really amazing. on the yellow [oled] brick road to tech nirvana. Yes, that is exactly what I got. The Dell Ultrasharp. It looks great along side the riMac. You will love it. I'm also thinking of upgrading from a non retina mbp to the new Rimac. As of now I'm mostly using the mbp as a desktop with the cinema display (2560x1440). I intend to use the retina display for regular viewing of the entire image in photo editing and the cinema display for 100% detail view. Images vary from 36mp for every day commercial work and 60-80 megapixels to 120-160mp when upscaled for large format printing. With this new machine I'd try gigapixel stitching and my thoughts so far have been to buy the 4gb ram rImac and have 4x8gb ready to upgrade. For the gpu I'd choose the 295x and of course go with the i7. I would love to have a 5k screen but since I don't work with 5k video, it wouldn't be necessary. Are there any concerns when it comes to the heat issue some users have been experiencing? Can I expect fans at the level of a starting jet when the retina imac's m295x has to render an additional screen? Is going for 64gb ram worth considering? I'm a little biased to the fusion drive, 256gb flash would be enough for me since I also have 2x1tb ssd hds for my mbp, which I would like to transfer/hook up. Any advice here? I'm thankful for any advice as reading up on all the options have confused me more than it should and I don't exactly have more than 3500$ to spend. It's funny, but of all things, text truly is the most noticeable improvement. More than photos, even more than 4k videos. Text just looks higher contrast. I too have a 2k monitor next to the iMac 5k (It's an Apple LED Cinema display, before the thunderbolt model), and it' just a great setup.